A capacitor stores electrical energy in an electrostatic charge. It stores or removes energy from this electrostatic charge in an effort to maintain a constant voltage across itself. This is much the same way that an inductor stores or removes energy from its electromagnetic field in order to maintain a constant current. A capacitor is made of two conductive plates separated by an insulator (called a dielectric). Placing a DC voltage across an uncharged capacitor causes electrons in the plate connected to the positive terminal of the voltage source to flow towards the positive terminal of the source. Simultaneously, electrons flow from the negative terminal of the voltage source into the other plate of the capacitor. This process continues until the capacitor becomes charged to the same potential as the source. The capacitor builds an electrostatic field with one plate charged with an abundance of electrons while the other plate has an absence of electrons. Capacitance is the ratio of the electric charge on each conductor to the potential difference between them. Capacitors are rated by the amount of charge they can hold. This amount of charge is measured in farads, named in honor of Michael Faraday. A farad is the amount of capacitance required to store one coulomb of electrical energy (6.28 × 1018 electrons) at a one volt potential. The symbol for farad is a capital F. A farad is a very large amount of capacitance; therefore, most capacitors are rated in microfarads or picofarads. Capacitors also have a voltage rating. If this rating is exceeded, the capacitor could be destroyed. As the surface area of the conductive plates increases, so does the amount of capacitance in direct proportion. Double the plate surface area and you have doubled the capacitance. You can increase the plate surface area not only by increasing the plate size but also by adding more plates. The distance between conductive plates has an inverse effect upon capacitance. As you decrease the plate distance, you increase capacitance. The last main factor determining capacitance is the dielectric constant of the insulator. Insulating material with a higher dielectric constant creates more capacitance. Window glass with a dielectric constant of about 7.5 creates more capacitance than air with a dielectric constant of 1.0. Capacitors should be handled with caution. Even after being removed from a circuit, they can retain their charge for a long period of time. Accidentially touching the leads can cause the capacitor to dischange causing a shock or worse. Capacitors are rarely included in a DC circuit. When an uncharged capacitor is placed in a circuit such as the one shown below and the switch S is placed in position 1, then a transient current will immediately flow through the circuit as the capacitor begins to charge. As the charge on the capacitor plates approches its maximum value, the current flow will decrease and then stop altogether, behaving like an open circuit. 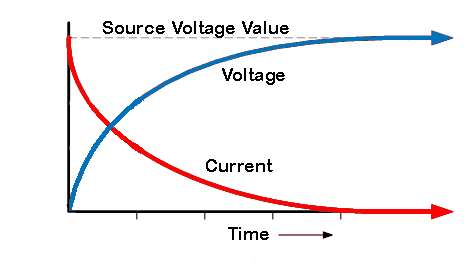 At the same time that the current is falling, the voltage across the capacitor is rising until it reaches the source voltage value at which time the capacitor stops charging and the voltage across it holds steady. A charged capacitor will effectively block DC. When the switch is moved to position 2 shown below, the battery is disconnected from the circuit and the capacitor begins to discharge. Immediately maximum current flows, but in the opposite direction to that during charging. 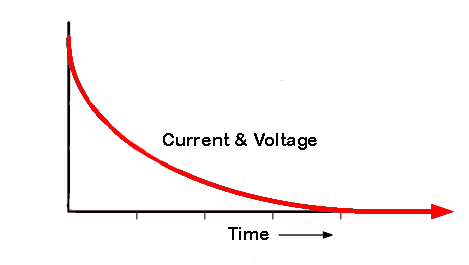 As the capacitor discharges, the current will decrease along an exponential curve until reaching zero. The voltage also falls at this time, reaching zero when the capacitor is fully discharged.